Zebra's 140XiIIIPlus is known for its high-performance, mission-critical ruggedness. This hardworking printer is the one to call on for heavy-duty, industrial operations. The 140XiIIIPlus offers superior connectivity solutions, including ZebraNet Bridge offering centralized printer and print server management capabilities (such as WebView and ZebraNet Alert) within a single, easy-to-use application. The 140XiIIIPlus gets the job done fast, printing at up to 12" (304.8 mm) per second. With such powerful performance and steel construction, it is the ideal choice for high-volume, mission-critical applications with 24-hour duty cycles. 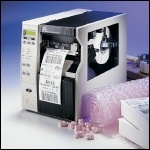 The 140XiIIIPlus is also well-suited for applications in which labels are required quickly, on demand or in batches. Model 140-701-00000, 203 DPI, 10 IPS Print Speed, 16MB DRAM, 4MB Flash, Serial, Parallel, USB, Clear Media Side Door, US Plug, ZPL. Model 140-701-00100, 203 DPI, 10 IPS Print Speed, 16MB DRAM, 4MB Flash, Serial, Parallel, USB, Cutter, Clear Media Side Door, US Plug, ZPL. Model 140-701-00200, 203 DPI, 10 IPS Print Speed, 16MB DRAM, 4MB Flash, Serial, Parallel, USB, Rewind, Clear Media Side Door, US Plug, ZPL. Model 140-701-00300, 203 DPI, 10 IPS Print Speed, 16MB DRAM, 4MB Flash, Serial, Parallel, USB, Cutter w/ rewind, Clear Media Side Door, US Plug, ZPL. Discontinued – Please call for replacement advice. Model 140-741-00000, 203 DPI, 10 IPS Print Speed, 16MB DRAM, 4MB Flash, Serial, USB, 10Base-T Prt Server, Clear Media Side Door, US Plug, ZPL. Discontinued – Please call for replacement advice. Model 140-741-00100, 203 DPI, 10 IPS Print Speed, 16MB DRAM, 4MB Flash, Serial, USB, 10Base-T Prt Server, Cutter, Clear Media Side Door, US Plug, ZPL. Model 140-741-00200, 203 DPI, 10 IPS Print Speed, 16MB DRAM, 4MB Flash, Serial, USB, 10Base-T Prt Server, Rewind, Clear Media Side Door, US Plug, ZPL. Model 140-741-00300, 203 DPI, 10 IPS Print Speed, 16MB DRAM, 4MB Flash, Serial, USB, 10Base-T Prt Server, Cutter w/ rewind, Clear Media Side Door, US Plug, ZPL. Model 140-7A1-00000, 203 DPI, 10 IPS Print Speed, 16MB DRAM, 4MB Flash, Serial, USB, 10/100 Prt Server, Clear Media Side Door, US Plug, ZPL. Model 140-7A1-00100, 203 DPI, 10 IPS Print Speed, 16MB DRAM, 4MB Flash, Serial, USB, 10/100 Prt Server, Cutter, Clear Media Side Door, US Plug, ZPL. Model 140-7A1-00200, 203 DPI, 10 IPS Print Speed, 16MB DRAM, 4MB Flash, Serial, USB, 10/100 Prt Server, Rewind, Clear Media Side Door, US Plug, ZPL. Model 140-7A1-00300, 203 DPI, 10 IPS Print Speed, 16MB DRAM, 4MB Flash, Serial, USB, 10/100 Prt Server, Cutter w/ rewind, Clear Media Side Door, US Plug, ZPL.